Absolutely love this dress! I was looking for a classic dress that my bridesmaids would be able to wear again. I couldn't have picked a better garment for the price, quality, and time in shipping. Will definitely be ordering from this site again. This was my first time ordering from this company, in addition to ordering a custom made dress. What a great experience! The dress is beautifully made and is very flattering. Lastly, I received the dress within a week of placing my order! Love it! Thank you very much! My dress came!!! I was so excited to open it. Great work. The lining is also very good. The needlework on the dress is careful. I love your work. I trust your company will make my another dress high quality. I am so excited to receive my another one from you soon.Thank you. 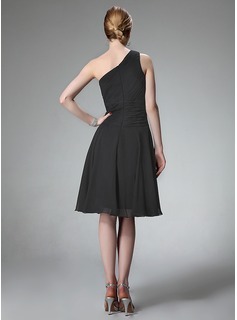 This black chiffon dress arrived within two weeks and looks like the picture. The quality is good and the fit is fine. This is the second dress that I have purchased from JJshouse. The quality is as good as the first one I ordered. Thanks JJshouse!!! Kan man få denne kjole i Silk like satin farven regency? ?